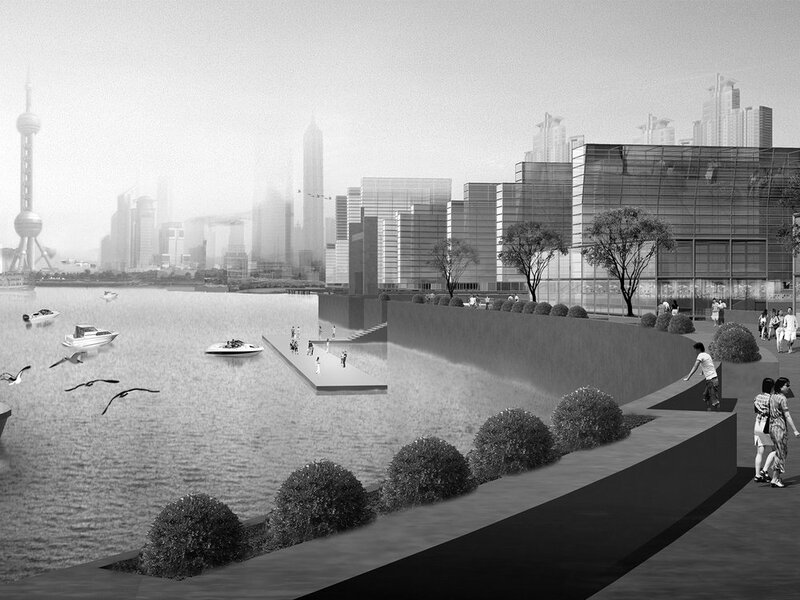 According to the overall planning of the Huangpu River to the west of Pu Ming Road planning of the Huangpu River to the open green space, viewing platforms, commercial promenade and marina. 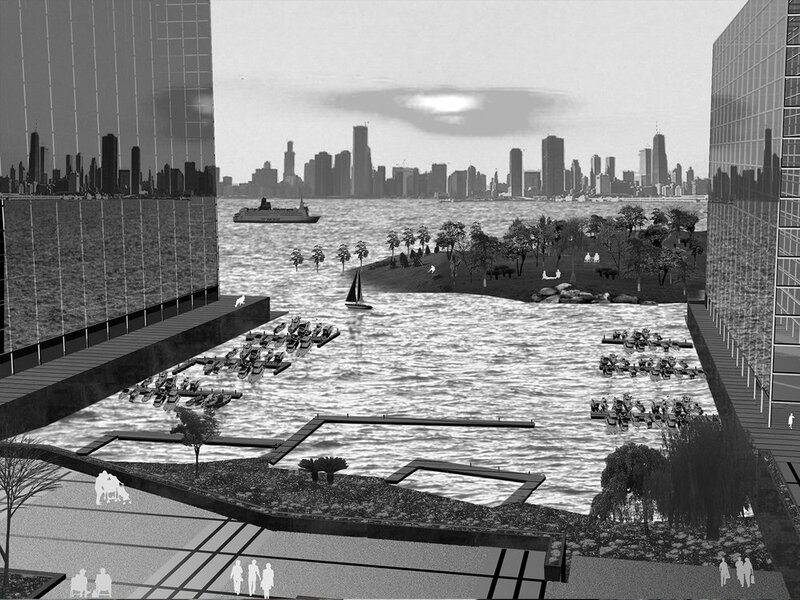 In this scenario, with the harbor as the core, through a private marina, public marina, hydrophilic cliff, hydrophilic bars, restaurants, clubs, viewing platforms, mobile landscape park and bring linpu Ming Road underground shops and convergence capability , and their potential to drive the entire E-18 plots contained. 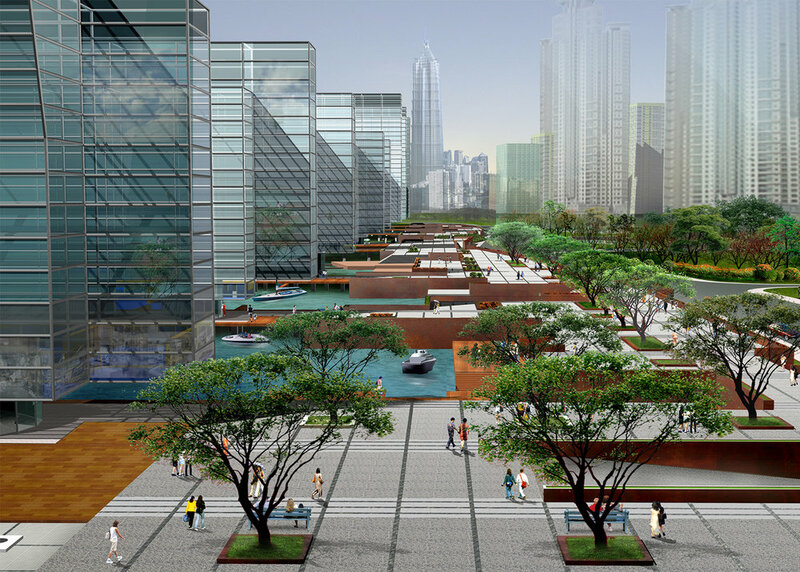 Riverside Landscape platform system while making life truly balcony communities and cities. Shanghai into a piece of green space will be stripped out, the designer starting from its structure to make the appropriate interpretation and found that the current Shanghai into public green sheet is mainly composed of the inner ring on both sides of the massive number of green components. In the heart of the old city, with former racecourse represented some central green at this stage can not form a complete system of urban greening. The Shanghai Huangpu River and the many waterways toward the Huangpu River just can link these scattered into a beautiful green massive practical system. Zhangjiabang Huangpu River and then you can participate in to this system in the past. Riverside Park levee north of the peninsula, south of the musical fountain plaza, a north-south corridor of the landscape, it is the green belt and Zhangjiabang district within walking waterscape with (now a large scale commercial use and educational parkland and sports and leisure venues, and the development of public construction area, retain and residential distance interval, contact the original road greening, deepening into a green pedestrian landscape system ) together form a green system of the program. E-18 plots the Huangpu River as a major plot development complement, or may not have, such as Lujiazui city as the Expo energy, but envisaged Expo, during the exhibition, which also can be a part of the Expo Village, there will be a number of exhibition spaces and platforms, this, the designer chose to urban waterfront luxury residential waterfront land as a primary function . While focusing on the construction of public facilities and public buildings set. There will be some more green public square and two passenger terminals nearby. Commercial buildings along the west side of the main focus in the ground Pu Ming Road, forming a commercial street, and on existing commercial area located in the northeast corner of land to form a more continuous pedestrian street. Zhangyanglu sections for commercial, office area, other areas are still living mainly waterfront area (Pu Ming Road to the west of the Huangpu River) for commercial and residential area.